Good illustration. Everyone understands pizza. If you want to know why the left is wrong about income inequality, you need to watch this Margaret Thatcher video. In just a few minutes, the “Iron Lady” explains how some – perhaps most – statists would be willing to reduce income for the poor if they could impose even greater damage on the rich. This picture is another way of getting across the same point. 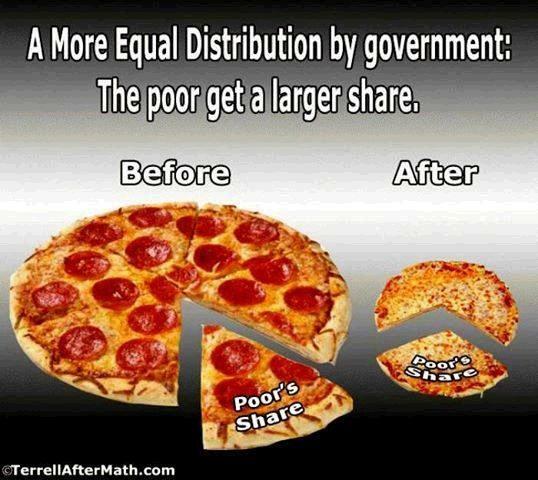 It was sent to me by Richard Rahn (famous for the Rahn Curve), and it uses two pizzas to show how leftist policies would “solve” inequality. I like this analogy, and not just because I also used the pizza analogy to make the same argument in this TV interview. The growing or shrinking pizza is useful because it helps to focus people on the importance of growth. The top climate official at the United Nations has described her role in pushing nations to contain the Earth’s climate as a “sacred” job. “We are truly defining the quality of life for our children,” Christina Figueres, the U.N.’s executive secretary for climate, told USA TODAY on the sidelines of the annual meeting of the World Economic Forum in Davos, Switzerland. “We have to do everything we can because there is no plan B because there is no planet B,” she said. “I fully intend my grandchildren and great-grandchildren to be able to live on this planet. This job is a sacred responsibility,” Figueres said. She also notes that the world has spent a trillion dollars so far to fight climate change and that we need to spends trillions and trillions more. Every year. And all controlled by the UN, I’m sure. Okay, we’ve all heard people at times sacralize their job, usually to show their dedication to a task that involves significant risk or hardship. Military and police come to mind. And, sure, politicians often prattle on about the sacred trust they’ve been given by their constituents, but most of us recognize that as a rhetorical device. Perhaps that’s the case for Ms. Figueres, too. Instead, it has the ring of sanctimony that brooks no debate or challenge. Indeed, if you question man-caused global warming or what, if anything, needs to be done to fight it, you’re putting her descendants at risk. It moves from being a matter of empirical, testable science, on which there can be reasonable disagreement, to a tenet of faith and morality, something holy. Disagree with her “sacred mission,” and you become a “denier,” one who has denied the faith. It’s a short step from there to being designated a “traitor to planet” and perforce evil. It would be funny, if only these people weren’t in positions of influence and power, with the ability to implement their programs to our great harm, if we don’t keep a close eye on them. You are currently browsing the Public Secrets blog archives for the day Sunday, January 26th, 2014.